Winter 2012-13 is playing her opening gambit. As Britons writhe in the grip of this first blast of icy weather, a small band of wised-up commuters are getting around quite happily – almost as if nothing’s going on at all, in fact. Speaking for myself, I’m pretty sure I can finish my 15-20 minute Edinburgh commute before some of the neighbours manage to defrost their cars, completely unhindered by the frozen mess of Edinburgh’s roads and paths. Local bike shop The Bike Chain (Canonmills, just off NEPN) have a couple of the more likely candidates on offer, although I hear stock is flying off the shelves like hot cakes: see the next section for online links. Before you can narrow your choice of tyre, you need to decide which bike you’ll be refitting. The narrowest option is the 30x700c Schwalbe Winter, which is still wider than you’ll fit on any racing bike; unless you have a cross bike, utility model or tourer it might be that you decide to leave your usual bike as-is and winterise your mountain bike instead (there are any number of 26″ options). However, if you can fit studs to your usual bike, you’ll avoid the agonising decision each day trying to work out which bike to ride (and then getting caught out) – like leaving your lights at home, it’s a bit of a gamble. Sure, they make a lovely rice-crispies noise and of course, they are a little slower than your summer race tyres… but who are you kidding? You’ll still be able to race the other commuters and beating them will be all the more satisfying! How much tread do you need? 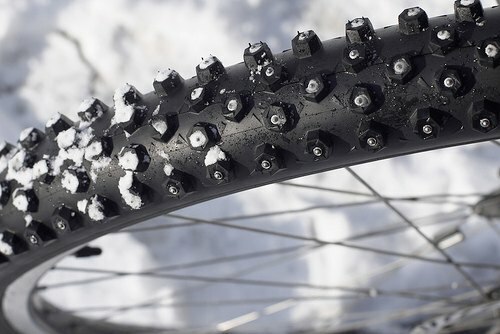 With similar stud counts, tyres will all be roughly as grippy on frozen surfaces (only the studs can cling into ice, the tread’s irrelevant) but if you need to ride through soft snow, the studs won’t make much contribution – then it’s all about the deep, widely-spaced rubber tread. 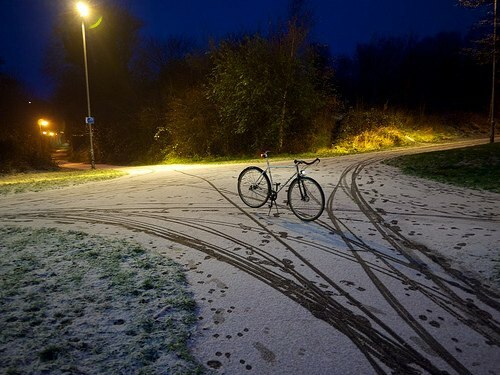 Generally speaking, the common hazards facing the domestic rider are frozen surfaces and (rarely) light snowfall – we don’t tend to get huge dumps of snow on a regular basis. For my money this makes the ‘road’ treaded tyres like the Marathon Winter (or Nokian A10, or W106) a great choice – they’re not too agonisingly slow on clear roads, have enough tread for an inch or few of snow in typical UK conditions, and plenty of studs for the daily hard frost or icy puddle that may cross your path. On the other hand, if the going gets really tough (or you want to ride off-road) those tyres will really struggle in any depth of snow. Look instead at the knobbly MTB-style options like Schwalbe’s Ice Spiker (or Nokian W206, Extreme, or Continenal’s Ice Claw). 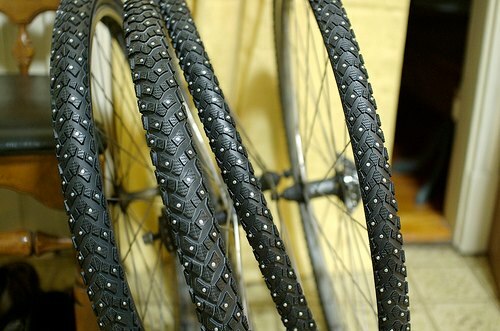 Generally these are 26″ tyres, although one or two are available for 700c/29er bikes too. whereas the Ice Spiker will be a right misery 95% of the time, and a great pleasure if all hell breaks loose! I’ve written extensively about the Marathon Winter already; it’s my own go-to choice. Look to pay around £40 for a single Marathon Winter, but with 240 carbide studs and excellent dry road manners it’s something I haven’t lost sleep over. I don’t have any personal experience here yet – although we’re contemplating an order for ‘serious’ off-road tyres to get some winter singletrack action at Glentress. However, from a cost-benefit standpoint the Ice Spiker (not Pro) looks like a good compromise – plenty of studs and a great tread pattern but competitively priced. You could pay more for the lighter Pro version, but who are we kidding? Are you racing off-road on snow now? The Nokian Hakka W240 are also pretty interesting, slightly more expensive with a slightly less aggressive tread. 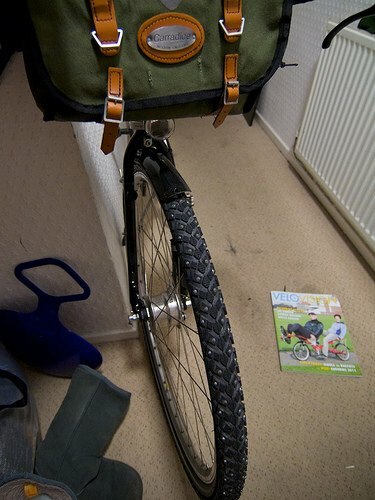 If we kit out both hardtails I think we may go for one set of each to compare, and I’ll update this. Interestingly, Schwalbe also produce a range of ‘Winter’ (not ‘Marathon Winter’) tyres which have a reduced stud count and correspondingly reduced price – at the time of writing you can get a 30x700c 118 stud Schwalbe Winter for under £20 (plus shipping) from bike-discount.de which also happens to be the narrowest studded tyre by some margin – the rest start at 35-40mm upwards. As the central studs provide 90% of the grip (the lateral ones mainly help the tyre climb out of icy ruts, not during ordinary turns) this could be all the tyre you need at a bargain price! Am riding in Moscow winters down to -15/20 C and few inches of snow on road and lots of ice and slush with regular 26″ 2.25 mid-knobby mountain bike tires, and find it works very well, without studs. Just have to be mindful to keep straight ahead on pure sheet ice when encountered and turn gently at all times. No doubt studs would give more confidence in turns and braking, but so far haven’t had to resort to it. I feel enough already like I’m on a John Deere after switching from the road bike in the Fall…! Yeah, pure snow is not so different from mud, so tyres with a decent tread work well. 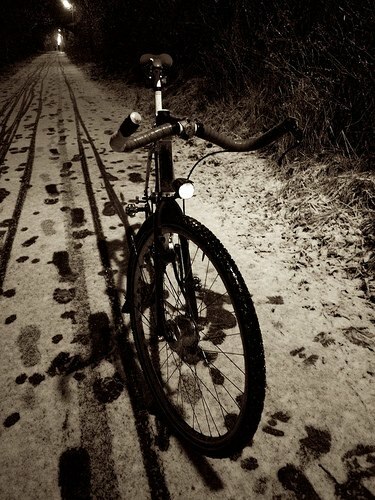 The studded tyres come into their own in conditions where the surface is hard packed and/or icy. A few times I’ve dismounted the bike and slipped because my feet don’t have studs (but didn’t realise it was icy while riding) although I must admit, now Edinburgh council is more committed to treating the paths, I don’t generally bother with studded tyres.